Completes darkness is always scary but a faint, ghoulish glow is just as scary too. If you like to decorate for the most spooktacular season of the year then you know lights, decorations, and even animatronics are a must. The more decorations the better... or should we say, spookier? Total darkness is definitely terrifying but not good when it comes to decorations. If it's dark, no one will see your beautifully festooned front yard. That's where these 10-piece LED color change skull light set comes in handy. 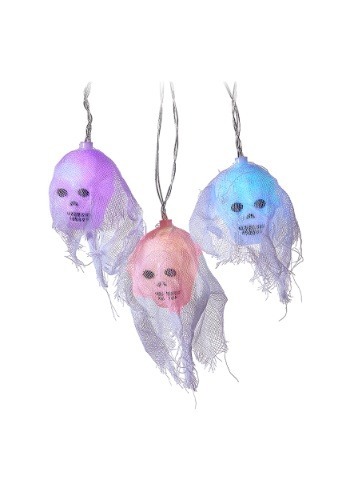 The veiled light-up skulls really know how to make the scene extra creepy. They're perfect for illuminating any type of graveyard scene, haunted laboratory, bloody butcher shop, or ominous pumpkin patch. Perfect for indoors or outdoors, these lights will create the macabre ambiance you crave. This LED light set is perfect for horror fans! Plastic skulls are attached to a black string. Once plugged into an outlet, each skull lights up a different bright color, like purple, red and blue. Wrap them around a tree or layer them around a staircase. Like this skull light set? Check out all of our spooky lights and illuminate a whole room.